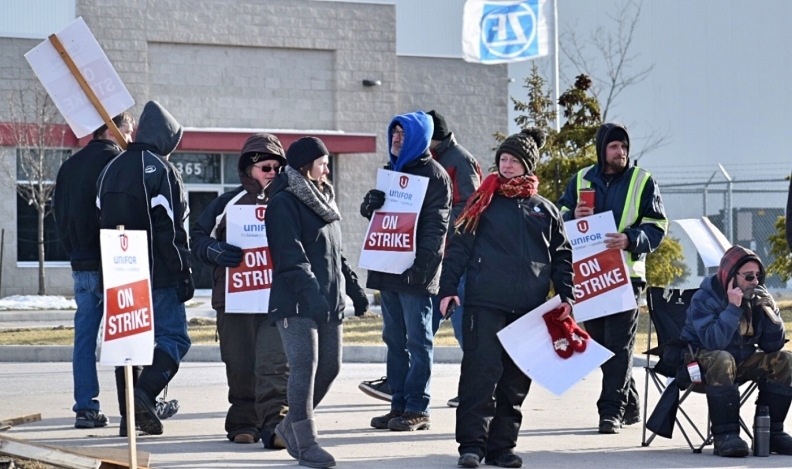 Employees of ZF-TRW in Windsor, Ont., walk the picket line. WINDSOR, Ont. -- Fiat Chrysler Automobiles Canada has cancelled Saturday minivan production in Windsor, Ont., because a strike at a nearby supplier has created a parts shortage, according to media reports. About 300 striking Unifor members at ZF-TRW assemble shocks, struts, springs and rear suspensions for FCA, which builds the Chrysler Pacifica in Windsor. The Windsor Star and AM 800 radio station both reported that FCA has told its unionized employees to stay home Saturday. In the United States, FCA had a 74-day supply of the Pacifica on hand on March 1, higher than levels considered ideal. The plant also builds the Dodge Caravan, which had a 23-day supply. Days of supply isn't publicly reported in Canada. Unifor executives were not available for comment. FCA Canada didn’t respond to calls or emails placed by Automotive News Canada. The union and management at four suppliers, including ZF-TRW, reached tentative agreements earlier this week. But, while employees at Avancez Assembly, Dakkota Integrated Systems, and HBPO Canada Inc. ratified a pattern agreement, employees at ZF-TRW rejected the deal. Only 38 per cent of members who cast ballots voted in favour of the deal, Unifor Local 444 said on its official Facebook page. “The [ratification] meeting went well,” Unifor Local 444 President Jamie Stewart told The Star. “I think it was a good agreement. We had two of the suppliers at 80 per cent, and the others (HBPO and ZF-TRW) at 50 or below.